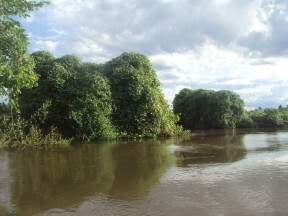 This species was described from the rio Cuiabá in Mato Grosso state, Brazil, seen here as it passes through the famous Pantanal wetlands. Thoracocharax: derived from the Greek θώραξ (thṓraks), meaning ‘breastplate, cuirass’, and the generic name Charax, type genus of the Order Characiformes, itself derived from the Ancient Greek χάραξ (chárax), meaning ‘a palisade of pointed sticks’, in reference to the densely packed sharp teeth. stellatus: Latin for starry or set with stars, a reference to the “platinum” shiny appearance. 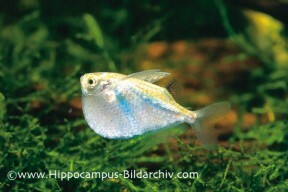 The most widespread of all neotropical hatchetfishes; it has been recorded throughout much of South America including Venezuela, Colombia, Ecuador, Brazil, Peru, Bolivia, Paraguay, and Argentina. It is thus considered to occur in several major river systems including the Orinoco, Amazon, and Paraná, plus many of their tributaries. Type locality is ‘Rio Cuiaba, Brazil’, which corresponds to the rio Cuiabá, an affluent within the upper rio Paraguai basin in Mato Grosso state, Brazil. Has been recorded in both black and clear water streams, tributaries, backwaters, oxbows, and inundated floodplains. Most often found in areas with an abundance of surface vegetation. An aquarium with surface dimensions of 120 ∗ 45 cm or equivalent should be the smallest considered. Cover a good portion of the water surface with floating plants, which will help to make this flighty species less skittish. It seems to enjoy a bit of current to swim against occasionally but some quiet areas should also be provided. Other décor is not particularly critical, but it looks good in both heavily planted setups and Amazon biotope-style tanks, with driftwood branches, a sand substrate and leaf litter. Make sure that the cover is very tightly fitting, since it is capable of clearing several metres in a single jump. Unlike relatives from genera such as Carnegiella, Thoracocharax species tend to descend from the surface and spend time in the upper third of the water column, motionless or actively interacting within the species group. Remaining close to the shore, it feeds primarily on insects; a study (Netto-Ferreira et al, 2007) determined that 99.6% of the diet of this fish consists of insects, and the majority (87.6%) of these were terrestrial. Sometimes a little reluctant to take dried foods initially, but it will usually learn to accept them over time. A large proportion of the diet should consist of frozen and live foods, such as bloodworm and daphnia. Gut-loaded Drosophila fruit flies make an excellent food if they are available. This fish feeds from the surface but also readily descends to snap up sinking foods. Very peaceful but it can be nervous, and will not compete well with boisterous species for food. 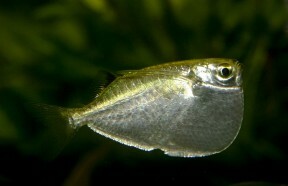 Good tankmates include other fish that inhabit different parts of the tank, such as tetras, bottom-feeding cichlids like Geophagus or Satanoperca sp., and catfish such as Corydoras and Loricariids. Always buy at least half a dozen, as it won’t settle without the security of conspecifics. The genus Thoracocharax was originally erected by Fowler in 1906 as a subgenus of Gasteropelecus, but was elevated to generic status by Weitzman in 1960 for the subject species and T. securis. The family Gasteropelecidae contains three genera. Thoracocharax, the most primitive and distinguished by its impressive keel, contains two species, T. securis and T. stellatus. Gasteropelecus contains three species, G. sternicla, G. levis and G. maculatus. These two genera contain the largest in size of the hatchetfish, and all are silver in colouration; G. sternicla is the more frequently seen of these five species, though any of them may be offered as “Silver Hatchetfish.” The third genus, Carnegiella, contains four described species that are the most derived or specialized of the hatchetfishes, and all are smaller and lack an adipose fin. 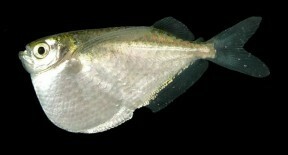 The results of the former suggest that Gasteropelecidae forms a monophyletic clade nested within the family Characidae, while the latter expanded on this and concluded that within the family Carnegiella is the sister group of Gasteropelecus with Thoracocharax sister to that clade, and that Gasteropelecidae appears most closely-related to the authors’ expanded Bryconidae which contains the genera Brycon, HenochilusandSalminus. Further notes on the relationships and classification of the South American characid fishes of the subfamily Gasteropelecinae.